In 1977, ethnomusicologist, Alan Lomax, spoke of the inherent brilliance embedded in community. He spoke of human flourishing and of the potentiality that exists in the myriad cultures in our world. He spoke of expression and enrichment, and illustrated not only the power of culture, but also what is at stake in its’ loss. Lomax’s directive in preventing this loss is still relevant today: a commitment to cultural equity. Our varied ways of intimately viewing, remembering and making sense of the world, and the ways in which we interact and connect with others are embedded in our cultural DNA. This complex cocktail of ingredients is integral to both our individual and collective survival. Fair and just treatment of all cultures, their expression and their nurturing form the basis of Cultural Equity. Like any infrastructure, Cultural Equity, or the lack thereof, is enacted and enforced by a power structure both visible and invisible. Our role in directing that structure is not negligible. In order to shape it, we must first define it. What follows are 5 elements of Cultural Equity. *This piece specifically relates to cultural equity within the realm of the urban, and the cultural institutions and organizations that shape them. Science has shown that in the face of possible extinction, diversity increases a species’ chance of survival. The greater diversity, the stronger the overall population. 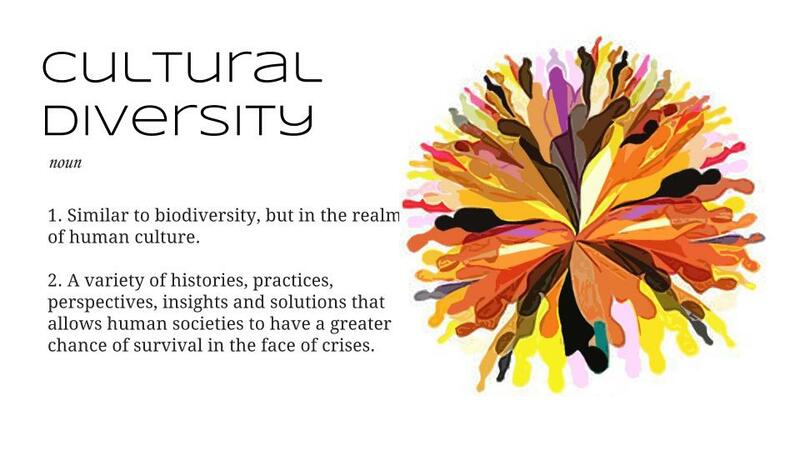 While biodiversity is the variation of life in any ecosystem, cultural diversity exists within the realm of human culture. It is founded on fostering the greatest possible pool of ideas, wisdoms, perspectives and insights. Since the 1960’s, talk of Cultural Diversity and it’s cousins, Multiculturalism and Pluralism, have been on the rise within the realm of our contemporary cultural institutions. With this has come a greater understanding of the importance of inclusion, tradition and identity; essential building blocks in producing institutions that are more accurately reflective of the many traditions that compose our nation. While important, mere representation of our diverse landscape may not be enough. Despite trends in our nation that show we are rapidly diversifying, we are just as rapidly becoming unequal. Systems that perpetuate an unjust distribution of resources prevent the flourishing and expansion of the varied cultures that are available to us. This reality weakens the strength of our whole. Despite the push for a multicultural and multi-participatory society that embraces our differences, a continued fear of the “other”, and a closed circuit control of our media and educational systems prevent us from learning from our differences, recognizing our common ground, and strengthening the adaptive, evolutionary potential of the herd. Seen through a lense of equity, cultural diversity maintains that resource distribution remain fair and just; that all “people have the right to inherit and develop their intellectual, emotional, material and spiritual traditions” (Haft, 2009); that these many cultures, grounded in tradition yet still evolving through time, be promoted within popular media and educational spheres; and that they be given space to define themselves by their own terms within these spheres. A practice of equity builds upon existing arguments of diversity through a lens of justice and equality to add an additional argument: survival – and increasing our chances of enduring as a civilization, and species. Can we see past a culture of dominance that erodes our diversity, and instead create a space for all of cultures to flourish? How can our practices nurture the embedded wisdoms of our varied histories? Can we create co-produced spaces built by the multitude of actors that inhabit the places we share? Scenius dispels the notion of the individual genius, the lone expert, and the belief that a sole person is responsible for brilliant accomplishments. Instead, scenius reframes the heroic individuals as impossible without the whole of it’s’ collective, networked parts. Scenius emerges from relationships, and can emerge at any time. It is the fusing and flourishing of our diverse strengths. Its’ transformational power lies in the creative act of collective imagination. To change the status quo we must be able to first envision, imagine, the potential of something completely different. When these ideas are cultivated in a shared, collective commons – spaces where agents can actively encounter one another – the potential of this imagination becomes stronger. 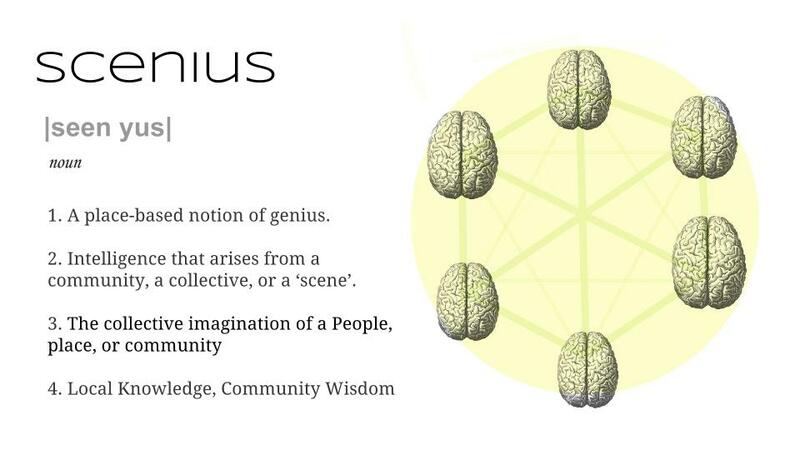 Acknowledging scenius means supporting not just sole individuals, but a myriad of cultural expressions, and creating the conditions that cultivate a spirit of production and imagination, the ability to form new, previously unforeseen ideas and chisel them into reality. An infrastructure of cultural equity is grounded in the notion that the collective imagination of people, both within and across difference, forms an emergent ability for previously unforeseen ideas to be developed and discovered – ideas that will be paramount in solving the urgent problems of our times, from climate change, to conflict-inducing inequality, to the militarization of our borders. Like the classic parable of the five blind monks tracing the contours of elephant, a broad, more complete understanding of the truth can only be revealed by the sharing of multiple truths. This dialectic communication and mutual respect is necessary if we are to remain relevant and flexible to the changing demands of our time and the crises we face. Addressing cultural equity in our cultural institutions is not only about increasing representation, but about fostering spaces for the co-creation of knowledge and innovative solutions. It is about both valuing and promoting the potential of a collective imagination infused with ingredients from many different backgrounds, knowledge systems and experiences. It requires building the relationships that strengthen our connection to place and promoting the involvement of diverse individuals and skill sets at the decision-making table. It involves stepping outside our comfort zones and making meaningful connections in the various places we call home. Can culture be quantified? If not, does it get destroyed? 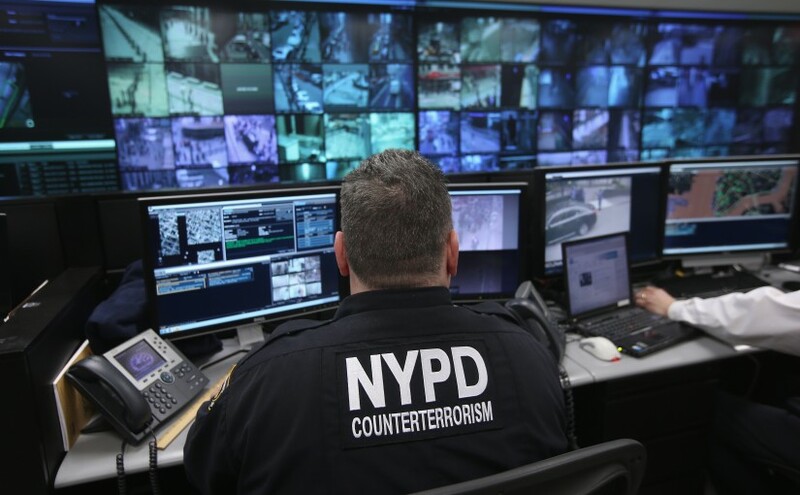 Modern Infrastructures are technocratic and bureaucratic, based on a desire for measurement, on a quantifiable and ordered understanding of complex systems. Measuring culture, it’s vitality, promotion and validation is a much more organic, nuanced process much of which often falls into the realm of the invisible. Sadly, in this premise: what you can’t see, you can’t value. What you can’t value, you won’t save. 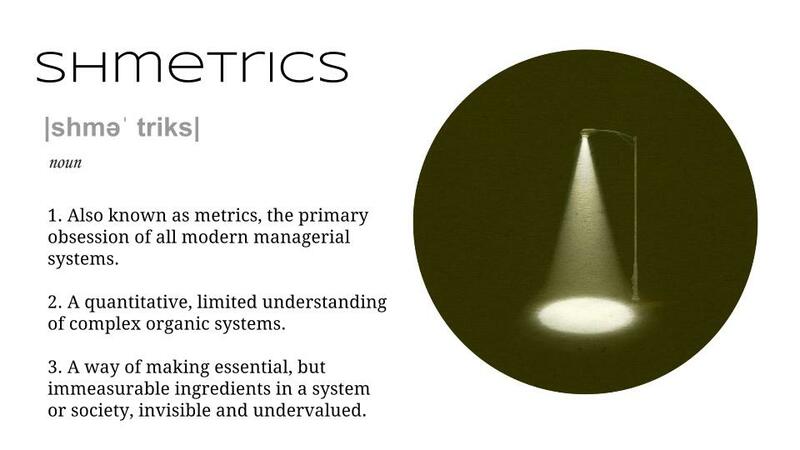 Metrics are also subject to manipulation. They can be skewed in ways that benefit those institutions seeking to satisfy their donors with a self-serving interest and a focus on their bottom line. They can be controlled so as to assume a greater impact. Currently, small cultural organizations face the pressing issue of dwindling funding and the often aggressive moves by larger institutions that out-compete them for public funding; public funding that was nonexistent prior to the efforts of the civil rights movements. While many of these small cultural spaces emerged from that critical moment and proudly carved a place for themselves within the cultural sphere, many of the large, mainstream arts organizations have now learned to play the metric game. They have embraced the language and theory of diversity – and can produce metrics accordingly – yet in practice, they fail. They seemingly responding to community-based issues, without actually changing their central mission and the actions of the group. Meanwhile, groups that have historically been shaped by their constituencies and who continue to remain responsive to local needs are forced to compete with the power of the imperial arts, who have closer relationships with donors, and superior institutional firepower when it comes to pursuing funding. Given the limited ability of metrics to measure the true nature of things, and the importance placed upon them in the administration of public resources, we are in need of a more nuanced, complete way of measuring the impact of cultural organizations. Now that we have come closer to a more equal form of representation there is a need to reflect upon it’s true impact. Cultural equity gives diversity a richer meaning within the science of metrics. It pushes forth the questions of “Who is being left out and why? What is valuable, but not being counted?” It asks what our relationships to people and place are. It includes the qualitative and the relational elements that often slip through the rigid framework of quantitative metrics. What are the relationships that strengthen the robustness of culture and the many communities that compose our cities. What kind of praxis enables a flourishing of culture? In addition to metrics, can we also develop systems that demand a continuous reflection of our actions and the forms of engagement by which we are serving of the communities? Can we create a more fair and just way of validating the spaces that promote understanding and promotion of culture? Reciprocity is an exchange across difference. However, this kind of exchange only happens, when built upon an infrastructure of relationships with real meaning and trust. Building this infrastructure, requires place. We can create the places and spaces that encourage this kind of reciprocity, embodied by the term: recipro/cities. ReciproCites are places that encourage an open flow of energy that moves us beyond social fragmentation, creating prosperous foundations in the places we live. In a system of complex reciprocity, expanded forms of human communication and connection are capable of forming. These exchanges are essential, but not always easy to see. Without a clear market value, are not given appropriate space to emerge. Despite their elusive form, they are immensely valuable for the creation of a diverse, and healthy ecosystem. Cultural equity supports the production of these spaces, both informed and produced by a multitude of histories and lived experiences. An emphasis on cultural equity asks for the creation of spaces that don’t just focus on producing material capital, but social capital, emerging from the experience of engagement and encountering. It demands platforms and support systems that help these new forms of exchange take place, systems that do not fit within a container, but rather grow and mutate, always in relationship to place and to each other. 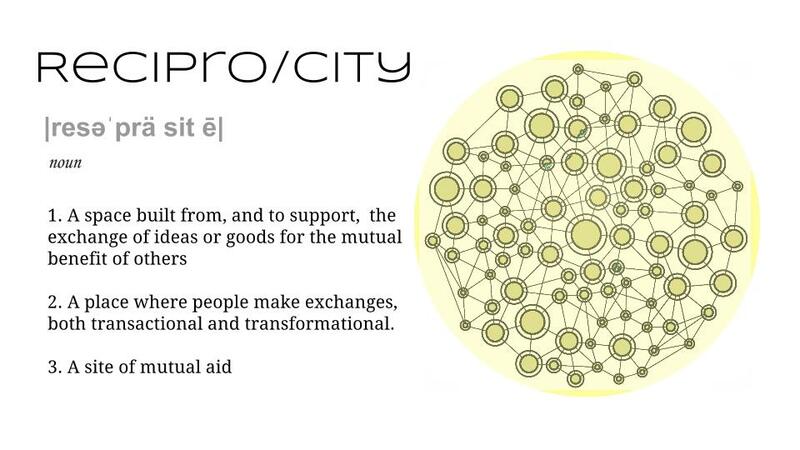 ReciproCity is the notion of a space designed to support the thriving expressions of many kinds of experiences. It is social form and the co-produced space that we inhabit. A central question in cultural equity is: who benefits from the development of our cities? In a market-based system that has coopted the notion of place-making, which has largely resulted gentrification of our cities, what is enhanced in this development? Rather than displacing the knowledge structures currently existing in our neighborhoods, can we instead push for a system that respects the desire for people to stay in the places they call home – to add to this dense architecture of relationships, rather than tear it down? Can planning build upon the important work that communities have already done, rather than replace it? Can our cities flourish as spaces that promote participation rather than competition? Cultures in our society have undergone considerable adaptation to their environment over time. However, they may in fact be increasingly “mal-adapted,” meaning adapted to an artificial environment that is not the one that will actually determine our survival. In modern society, most cultures have been forced to adapt to the framework of a neoliberal capitalist market system, one that is in fact incompatible with the natural systems that we depend on for survival. In this adaptation, we have become separated from each other; we are taught to practice vicious competition, despite abundance; we learn to extract from nature beyond what even science tells us is reasonable. It is an adaptation to a system of self-destruction, a social habitat invented by capitalism. Worst yet, this habitat is practicing unnatural selection: eroding or destroying the diversity we need to adapt to our natural habitat. In direct contrast, Cultural Equity helps preserve diversity. It allow us to maintain the full spectrum of solutions ideas, perspectives that we need to survive. It allows us to preserve our most adapted forms in the interest of humankind.